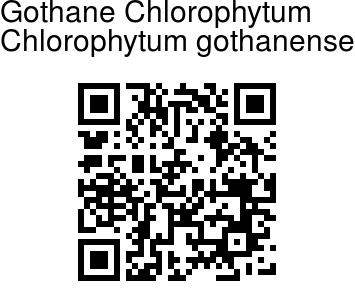 Gothane Chlorophytum is a perennial tuberous herb. Root tubers are 5-13, stalked, elliptic, spindle-shaped, up to 15 cm long. Leaves are 5-11 all arising from root, stalkless, overlapping at base; leaf blade 7-37 x 1.5-3 cm, lanceshaped to lorate or ensiform, slightly sickle shaped, subleathery, channelled, 14-18 veined, tip pointed-tapering, margins hyaline. Flowering stem is one or two, up to 35 cm long, unbranched, usually longer than leaves, without sterile bracts in the lower portion. Flowers are white, 2.4-2.6 cm across, bracteate, flower-stalklate, usually in alternate clusters, each consisting of 1-3 flowers. Floral bracts are large, subtending many smaller bracts, 0.7-1.0 × 0.3-0.4 cm, persistent, pointed with triangular basel flower-stalks 0.9-1.3 cm long, whitish, jointed at the middle, nodding in flower, Tepals are 6, in two whorls of 3 each, divergent in flower, outer tepals 1.2-1.4 x 0.3-0.4 cm, ovate-elliptic, 5-nerved, white, tip pointed. Inner tepals 1.3-1.4 x 0.3-0.4 cm, lanceshaped, flat, 5-nerved, white, tip blunt. Stamens 6, 0.7  1.0 cm long, spreading, erect; filaments 0.4  0.5 cm long, white, linear throughout, equal or shorter than the anthers, hairless; anthers 0.4  0.5 cm long, yellow, 2-celled, splitting by longitudinal slits. Ovary 23 mm broad, stalkless, green, spherical; style 1.2  1.3 cm long, spreading, declinate; stigma minutely papillose at tip. Capsules is green, brown to black at splitting, triquetrous to 3-grooved, 0.70.9 × 0.60.8 cm, inverted-heart-shaped. 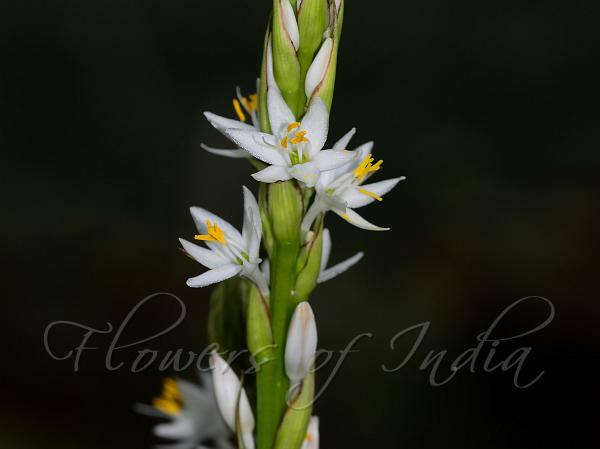 Gothane Chlorophytum is found in Western Ghats. Identification credit: S.R .Yadav Photographed in Kolhapur, Maharashtra.